Originally titled "Denise" I've renamed this piece "Twisted Winds" due to its unisex status. Regardlesss of its name, this hat was inspired by my sister in law, Denise, and her gloriously curly hair (it runs in their family). This hat fits Teens, Women and Men, as it will stretch to fit head sizes 20-25”. Very simple cabling techniques make this hat look far more complex than it is, much like the wind whipping about, no matter how it twists, it is still just air. 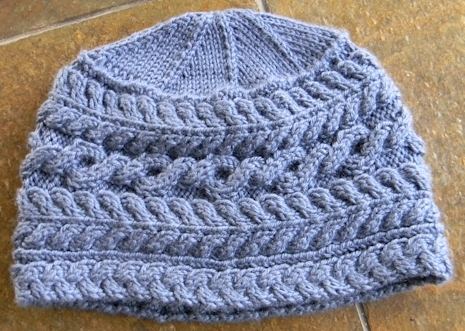 The main body of this hat is knit back and forth, then joined into along cast on and bound off edges. 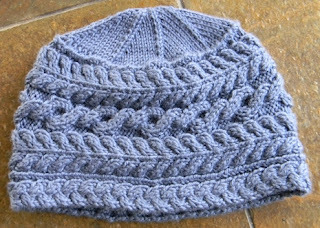 Stitches are picked up along top edge, and crown is knit in the round to close. Pattern is available on my website (MyKnits.com) as well as from Ravelry.com.